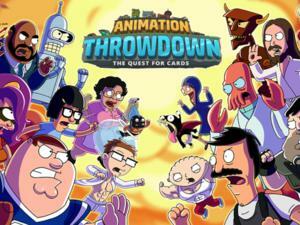 Animation Throwdown fuses Family Guy, Futurama, and… card combat? Star Wars fever continues unabated, with the recent release of Rogue One in theaters and the much-anticipated Episode VIII later this year—and alongside the films is now a glossy new iPhone and iPad game, Star Wars: Force Arena. Pulling together heroes from various Star Wars flicks, not to mention other media, Force Arena takes some cues from last year’s wonderful Clash Royale while adding more hands-on combat to the mix. You won’t simply toss down character cards and watch all of the action in Force Arena. Ultimately, it plays a bit more like a full-fledged MOBA (multiplayer online battle arena) game, akin to Vainglory on iOS or League of Legends on Mac, and it’s packed with great-looking character models and plenty of fan service. Force Arena is also a lot of fun, and it’s free-to-play of course, although the card-based design means that there are clear benefits to spending real cash. Like Clash Royale, Star Wars: Force Arena challenges you to make your best deck of cards, each of which tosses a unit—a stormtrooper battalion, a raging Wookiee, or an armored vehicle, for example—onto the map to fight for your cause. Once in battle, you’ll use your limited resources to send these units into combat and try to take down the enemy’s turrets and shield generator… before he or she can wipe out your own structures. Force Arena does feel a lot like Clash Royale in premise and execution alike, but it also shifts the balance back towards traditional MOBA design by giving you a leader to actively command. Instead of only tossing down unit cards, you’ll also guide one of many well-known legends of the Star Wars universe, including the likes of Luke Skywalker and Princess Leia on the Rebel side, and Darth Vader, Grand Moff Tarkin, and Grand Admiral Thrawn with the Empire. It even has some Rogue One heroes in the mix, such as Jyn Erso and Director Orson Krennic. Leia holds her own against the Empire’s elite (R.I.P. Carrie Fisher). Leader choice is as crucial to success as how you build your deck, as each has its own ranged or melee attack, as well as a special skill and an automatic ability that manifests on the battlefield. And there’s another really cool thing that Force Arena does with its deck construction: certain Unique cards can only be used with one particular leader, and they’re more powerful allies than you’ll find with the other various cards. If you can pair a leader with its Unique companion, you’ll probably have an advantage over an opponent with only a leader in tow. While 1-on-1 battles are the primary draw of Force Arena, the game also includes 2-on-2 battles in larger arenas, inching it even closer to a more classic MOBA experience (like the 3-on-3 action of Vainglory). And if you’re in a guild, you can team up with a partner to take on a two-player team from a rival guild. Walking into an array of active enemy turrets is a really bad idea. Whoops. You can improve your deck by earning or redeeming free card packs, buying individual cards from the store, or using the trading functionality to swap spares. Upgrading your current cards—by obtaining a certain number of duplicates and spending credits—is also key, since it’ll boost their stats and make them more effective in battle. And doing so earns you experience, which then boosts your player profile and likewise strengthens your in-game structures. Surely you can see how spending money for more and more cards is a benefit, right? Luckily, Star Wars: Force Arena is very generous with free card packs, using a similar system to Clash Royale’s own. You’ll earn a Free Pack every few hours, plus you’ll get an even better Victory Pack each time you win a match—although you’ll need to wait three hours or more for the latter packs to unlock, depending on quality. And even if you play a match and don’t win, you’ll still earn points towards unlocking a separate Play Pack. Furthermore, logging in regularly brings daily rewards that grow in allure over the course of a full week. Play daily and you’ll get some pretty solid rewards. In short, you’ll find many ways to stock up gradually over time, although you can pay to grease the wheels a little bit. The Premium Booster makes it easier to quickly cycle through rewards, as it both cuts the wait time in half for unlocking Victory Packs and also gives you an extra slot for storing said packs. Without paying, you can only hold four Victory Packs at a time—and can only unlock one at a time, whether or not you pay—and there’s less incentive to play the game if your inventory is full and you can’t win another pack. Engaging the Premium Booster isn’t cheap, however: it’ll cost you $6 for a week, $10 for two weeks, or $18 for four weeks’ worth of time. For persistent players, the benefits could be worthwhile—but without a more tangible benefit as part of the boost (say, an extra bonus pack of cards each day), that seems like a lot to pay for relatively small perks. Going Premium adds a pack slot and cuts the unlock time in half, but they seem like relatively modest benefits for the cost. Otherwise, you can spend money to buy bundles of crystals, the premium currency, and then use those to buy premium packs of cards or trade them for credits, the other in-game currency. Credits are handed out pretty regularly from free and earned card packs, while crystals come sparingly. Naturally, the premium card packs in the game require a heap of crystals, including the Platinum Pack for 950 crystals and the Diamond Pack for 2,090 crystals. You might play for free for a year and still never earn enough crystals to snag a Diamond Pack, but a pack of 2,400 crystals costs $20 in real money. Still, I couldn’t help but wonder: exactly what the hell comes in a nearly-$20 pack of digital cards? So I spent that mighty sum, and the answer is… lots of cards, of course: 160, to be exact, as well as about 1,200 credits. It was a massive, sudden expansion to my card library, giving me dozens of sandtroopers and other common units, and also my first Darth Vader in the process. With that many sandtroopers, maybe one of them can actually hit an enemy target. Was it worth nearly $20 in real money? No, I don’t think so. I was able to upgrade a few of my cards and level up my player profile in the process, which strengthened my buildings and brought a clear statistical improvement as a result. But on the battlefield, I didn’t feel like there was any massive advantage or difference from before. It helped, but I didn’t feel like I’d bought my way into sure success. Well, not $20 worth of success, at least. Thankfully, while Star Wars: Force Arena has a lot of ways to nudge you into spending money, it doesn’t do so forcefully, and it doesn’t feel totally necessary. Any competitive game with in-app purchases is sure to have some level of imbalance, and reaching for your wallet can help you access cards and stats that would take weeks or months of steady, unpaid play to obtain. For my money (or lack thereof), Force Arena isn’t quite as addictive as either Clash Royale or Vainglory, but it finds a solid place right in the middle—and it’s a lot of fun, even when you’re being pummeled by one of the galaxy’s greatest villains. If you’ve been eagerly awaiting a Star Wars multiplayer action experience on mobile, then Force Arena ought to grab your attention.